I don’t want to write many tool reviews for this blog; tool selection is such a personal matter, and there are plenty of people more qualified than I to write reviews. That being said, I have some tools which do their job so perfectly, and have been made with such craftsmanship, that I can’t help but recommend them. My Badaxe saws are definitely in this category, as is the dovetail marker I recently bought from Sterling Tool Works. 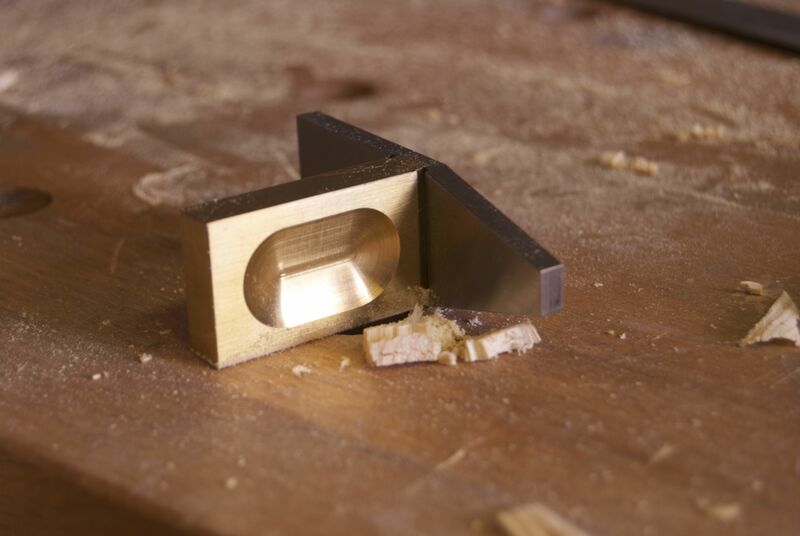 Like many others, I first read about Sterling Tool Works on Chris Schwarz’s Popular Woodworking blog last December. As 2014 had already been earmarked as the year in which I was going to start dovetailing (not a skill which is necessary in lutherie, unless you’re Howard Klepper), I took note and ordered the Saddle-Tail Original from Sterling Tool Works. The first thing that struck me was how approachable and helpful Sterling Tool Works were. Even before I had placed an order, Chris at Sterling Tool Works had responded to emails very promptly (all the more impressive considering there is a 7 hour time difference between us, and I was emailing on a Saturday). The Schwarz does not recommend tools lightly so I knew to expect a quality tool, and when the Saddle-Tail arrived (less than two weeks after I’d placed the order, again, very prompt for shipping from America to the UK) I was far from disappointed. Doubling as both a dovetail marker and saddle square, the Saddle-Tail has a very substantial feel thanks to it’s generously proportioned steel head and brass body. This weight keeps the Saddle -Tail seated on the workpiece, and it feels more robust than other dovetail markers I have tried. The length of the head allows you to mark-up two boards at once, facilitating gang-cutting if you are that way inclined. The brass body, fitted to the head by way of a slot and two screws, is flutted for ease of picking up off the edge of a board and the curves of the fluting have a lovely feel in the hand. One of the most important details is the relief on the inside corners, which means that the Saddle-Tail will still it square even if the board has not been squared, or if the edge of your board retains a burr. I selected the 1:4 slope for a bold, contemporary, dovetail, although 1:6 and 1:8 slopes are also available for the more traditional woodworker. Sterling Tool Works now offer a cheaper Saddle-Tail which omits some of the details of the Original to offer the essentially the same quality tool at a lower price. There is also a leather holster in which to store the Saddle-Tail, which can be screwed to the side of your tool chest for ease of storage. I cannot recommend the Saddle-Tail too highly. It is a quality tool made by approachable craftspeople who care about what they do. If, like me, your tools are an expression of the values of craftsmanship which we all seek to put into our own work, then this is the perfect addition to your tool chest. Sterling Tool Works have also announced a new plane adjusting hammer, and are taking pre-orders on the first production run. If it has the same attention to detail and craftsmanship of the Saddle-Tail it will be an excellent tool; I have already placed my order and cannot wait to test it out in the workshop.